Seller: peakxv (1,043) 100%, Location: Rothesay, Ships to: CA, US, Item: 132973154220 A very nice glazed Islamic Pottery urn with very vibrant colors derived from minerals. Measuring 15" in height inclusive of lid and 28" in circumference around the middle of the urn's belly. Lovely, mesmerizing, floral design with telltale red clay of Punjab under glaze. 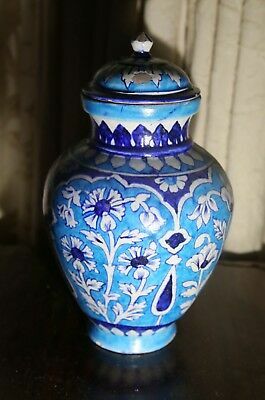 Persian, Indian, British influence excellent Raj era piece for any and all pottery collections. See photos for actual condition. Expert, ,Safe, Well Padded Shipping provided to all destinations on the globe. Condition: In very good overall condition commensurate with age. Glaze chips to rim, base, lid and urn body. Large chip to rim and foot. See photos for actual condition.